You may ask yourself, "Why should I try something that researchers are not sure will work?" That is a good question. Being part of a clinical trial may have risks, but it may also have benefits. You may get a new treatment for a disease before it is available to everyone. You play a more active role in your own health care. Researchers may provide you with medical care and more frequent health check-ups as part of your treatment. You may have the chance to help others get a better treatment for their health problems in the future. You may be able to get information about support groups and resources. The new treatment may cause serious side effects. The new treatment may not work or it may not be better than the standard treatment. You may NOT be part of the treatment group (or experimental group) that gets the new treatment—for example, a new drug or device. Instead, you may be part of the control group, which means you get the standard treatment or a no-treatment placebo. The clinical trial could inconvenience you. For example, medical appointments could take a lot of time or you might be required to stay overnight or a few days in the hospital. How Will My Safety Be Protected? 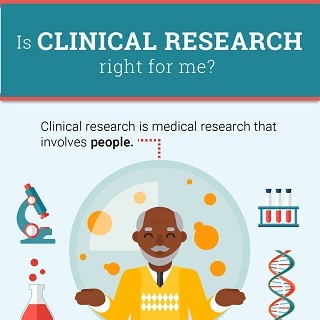 Read and share this infographic to learn more about how clinical research might be right for you. This is a very important question. The history of clinical research is not perfect. Based on many years of experience and learning, Congress has passed laws to protect study participants. Today, every clinical investigator is required to monitor and make sure that every participant is safe. These safeguards are an essential part of the research. Research abuses like the Tuskegee Syphilis Experiment, which began in 1932, before safeguards were in place, will NOT happen again. Researchers are required to follow strict rules to make sure that participants are safe. These rules are enforced by the Federal Government. Each clinical trial also follows a careful study plan or protocol that describes what the researchers will do. The principal investigator, or head researcher, is responsible for making sure that the protocol is followed. An Institutional Review Board, or IRB, at each study site must approve every clinical trial in the United States. The IRB is made up of doctors, scientists, and lay people, like yourself, who are dedicated to making sure that the study participants are not exposed to unnecessary risks. The people on the IRB regularly review the study and its results. They make sure that risks (or potential harm) to participants are as low as possible. Along with the IRB, many clinical trials are closely supervised by a Data and Safety Monitoring Committee. The Committee is made up of experts in your condition who periodically look at the results of the study as it is in progress. If they find that the experimental treatment is not working or is harming participants, they will stop the trial right away. The informed consent process also helps protect participants. Before joining a clinical trial, you will be told what to expect as a participant and all the things that might happen. For example, someone from the research team will explain possible side effects or other risks of the treatment. As part of the informed consent process, you will have a chance to ask questions about the trial. The clinical trial coordinator will be happy to answer your questions. After getting all this information, you can think about whether or not you want to participate. If you decide to join the trial, you will be given an informed consent form to sign. By signing the form, you show that you have been told all the details and want to be part of the study. The informed consent form is NOT a contract. You can leave the trial at any time and for any reason without being judged or put in a difficult position regarding your medical care. Researchers must keep health and personal information private.